Nuttall Temple was designed by Thomas Wright and built in 1754-7. Pevsner describes it as "one of the four or five descendants of Palladio's Villa Rotunda; or, in this case, a descendant of a descendant of the villa, Scamozzi's Rocca Pisana.". It was demolished in 1929: the site now lies under the northbound carriageway of the M1 near Junction 26. 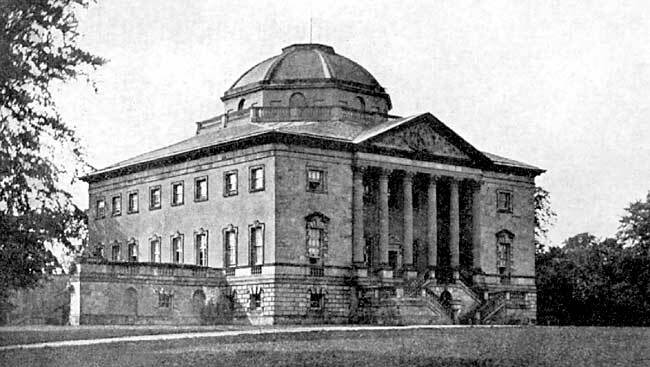 NUTTALL Temple has never been a show house, but it is celebrated throughout the country no less on account of the beauty of some of its internal features than of the estate of its owners, who have not only been men of affluence and position, but whose names have been identified with the history of the country in comparatively recent times. In the latter part of the last century this elegant mansion, with its lofty dome, the interior of which is beautified by the handiwork of Italian artists, who have copied with consummate skill the supurb art of the villa Capra, was the principal residence of a family whose title has become extinct, and whose name is hardly remembered in these days—I mean the Sedleys. The last of these baronets, Sir Charles Sedley, died at Nuttall Temple, in August of 1778, at a comparatively early age, leaving his property, or at any rate the most important portion of it, which embraced the Nuttall estate, to his daughter, who had married a son of Lord Vernon. On the acquisition of this fortune, Mr. Vernon does not seem to have exhibited any reluctance to change his name to Sedley, and so the old family was perpetuated for another generation, in name at any rate, though with different titular honours. For the Sedleys were a very old family. Long before they were known in Nottinghamshire they had considerable estates in Kent, and were territorial magnates in the garden of England. In the south, traces of them have been found as far back as the middle of the fourteenth century, a circumstance, which, apart from the connection of the family with this county and their residence in this house, about which I shall have to say something presently, may well warrant the revival of a dead name, if not of an extinct title. In the ninth year of James the Fifth’s reign, William Sedley, founder of the Sedleina lectures at Oxford, was created a baronet, perhaps more as a reward for scholarly attainments than for political services, for this was a studious family, with plenty of brains and abundance of energy. One of them was a by no means unpopular poet, and it is on record that Charles the Second was partial to the society of this clever man. But the successful versemaker sacrificed his immortality to the tastes of a sensual court; he employed his Muse in the service of corruption, and his name perished. Sir Charles Sedley, of Nuttall Temple, the last of the baronets, was the best known member of the family in the town and county. Like his ancestors, he was a man of learning and erudition, and was a Doctor of Civil Law of the University of Oxford, but he was also a political figure of some importance, and a most influential patron of the turf. He was elected member of Parliament for Nottingham, in 1747, and was re-elected in the following year. After enjoying an interval of retirement from public life, he again successfully sought the suffrages of the electors of Nottingham at the general election of 1774, having four years earlier been appointed Ranger and Keeper of his Majesty’s Chase for Nottinghamshire, an appointment which was in every way congenial to his English taste, and possibly somewhat remunerative. The Nuttall estate, as well as the manors of Hayford and Harleigh, came into the Sedley family by marriage ; it came into that of the Holdens, who have had it for three generations, by purchase. The Rev. Alexander Atkinson Holden, M.A., the present owner of :Nuttall, is the third of five brothers, of whom the second was his predecessor, the late Colonel Robert Holden, and the youngest, Captain Henry Holden, Chief-Constable of Nottinghamshire. These represent the younger branch of the Holdens, of Ashton, in Derbyshire, a family at one time among time most influential of that county. Mr. Robert Holden, of Darley Abbey, and of Nuttall Temple, married an heiress of the Drury-Lowe family, and by ties of relationship the Holdens are connected with some of the best houses in Derbyshire. The Octagonal Hall at Nuttall Temple. The impressive stuccowork was by Thomas Roberts of Oxford. The memory of the late Colonel Holden, whose death took place some ten years ago, will not readily be effaced. The latter portion of his life he devoted to good works, which were not confined to his own village and to his own people, nor was the flow of his sympathies checked by any narrow prejudices. To this day his kindnesses are spoken of in the village, where he lived for so many years, and his name will live among the promoters of societies for time spread of Christianity and religion. One of the rooms at Nuttall Temple was the centre of a system of private outdoor relief, which the kind-hearted Squire himself inaugurated and kept up. To this room the poor came for materials to make clothing and not unfrequently these gifts were supplemented by articles of food in needy cases. With the death of Colonel Holden I am told that the system dropped through, but its author is not forgotten by those to whom it was extended. If Colonel Holden had had a family to assist him in the enjoyment of the charming estate, which was all his own, it is possible that the bounds of his liberality might have been more circumscribed, though that is a matter into which we cannot well enter. We must speak of things as we find them, and all that can be said of Colonel Holden is that he was a man at once liberal and tender-hearted, doing good after his own fashion, and that a laudable one, and ever anxious for the spiritual welfare of his fellow-men. That the late Colonel Holden was a man of considerable taste in art matters is manifest when one sees the purchases that he made in the way of pictures and other ornaments. Nuttall Temple is a treasure house of pictorial art. In the drawing room, in the dining room, in the billiard room, and in the library there are pictures, many of them by masters, and most of them interesting. In the library, above the well-stocked book shelves, is ranged a collection of portraits, all of them of personages of note, not one of whom I am enabled to name. There are courtiers and philosophers—men from whose features, traced by a master hand, there are beams of intellectual power ; there are men of firm lip and daring eye who would face death in the cause of the right, and there are men who would ornament a court. But they are a collection of time unknown. Their owner does not know them, though he may be perfectly familiar with the history of the times in which their originals lived. All that I can say about them is that they are a silent collection of celebrities, who have been famous or notorious in various walks of life, and that they were purchased by the late Colonel Holden. In one of the other rooms is a famous picture by Wright—who had so many patrons in this county—"The Captive ; there is also superb representation of a beggar boy, which is ascribed to Murillo, and the portrait of an old lady by Rembrandt. The massive features of Charles James Fox, and beneath them a figure in a well-fitting costume, form one of the pictures in the Nuttall collection, and there are three family portraits which are interesting because they are those of three gentlemen, whose names are well known in this county. These are in the dining room, and they represent one of the Lords Middleton, Mr. Whetham (of Kirklington), and a Mr. Holden. These three were on very friendly terms, and they are associated together, though in separate frames, on the walls at Nuttall. In the billiard room are several good landscapes, including one by Turner, which would delight the eye of Mr. Ruskin, containing, as it does, some of the best elmaracteristics of that great painter, but about the remainder of the collection I was unable to learn anything. 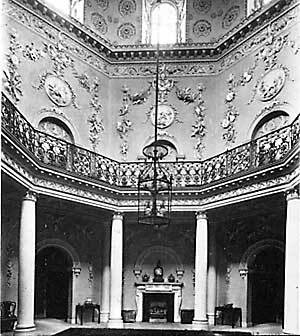 Everybody that goes to Nuttall is struck within the magnificence of the cupola which springs from time entrance hall, and which serves to light that handsome apartment. It is indeed singularly beautiful, not only on account of its airy loftiness, but because of the exquisite shapes and figures in has relief with which its walls are adorned. These are in white plaster, and were the work of chosen Italian artists. The hall beneath is octagonal in shape, and its pillars support a light gallery, which brings one face to face with time beautiful work on the walls. At two places in Kent, and nowhere else, there are copies of time original rotunda of Palladio, which Nuttall Temple represents. It is the dome which gives a temple-like appearance to this fine house at Nuttall, that, sheltered and hidden as it is by fine trees, and kept private by a broad expanse of park land, is not much known to the public. The entrance is approached by an elegant flight of steps, on the summit of which is a portico, supported by done columns, and overlooking a park, in which there is sonic good timber. A large sheet of water of picturesque formation improves the appearance of the estate in the immediate neighbourhood of the house, affords a home for water fowl, and provides sport for those of the family who care for pond fishing.